The first and only particularly involved step of of making a periscope is to draw and cut out the foamcore mirror holders. The pattern above will make both the top and bottom mirror holders at once, as long as the vertical and horizontal line are perpendicular to each other. 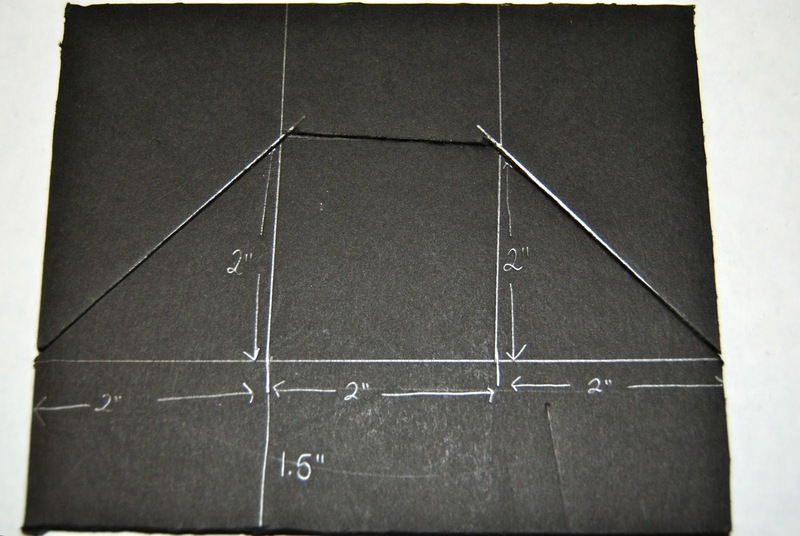 The only important dimensions are the 2'' line segments. The horizontal segments correspond to the diameter of the tube and the vertical segments are identical to make 45 degree diagonals for the mirrors. 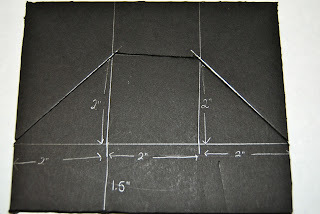 If you were to use a 1.5'' tube or a 3'' tube all the 2'' measurements would be 1.5'' or 3'' respectively. The 1.5'' dimension would be unchanged as it just extra area to glue the mirror holder to the cardboard tube. Once you have your lines drawn cut the two mirror holders apart, and score the vertical lines so the they can fold like so. Put a generous amount of hot glue on the bottom of the mirror holder and hold it on the end of your tube until the glue sets. If you have a telescopic cardboard tube just repeat this on other side. If you have a single tube you'll need to think about where you want you periscope to look. If both mirror holders are glued in the same orientation the periscope will look behind you. If one is forward and one backward you can look forward. 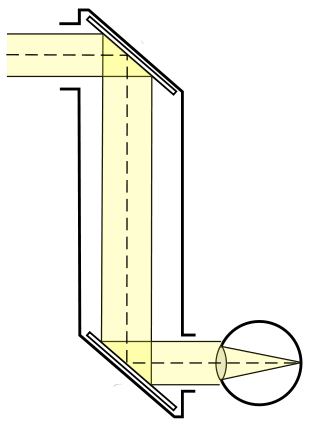 The telescopic tube gets around this problem by pivoting, so you can look in any direction. Here's the finished tube and mirror holders. If this were a non-telescopic periscope it would be forward looking in this orientation. To make the periscope functional, carefully glue the acrylic mirror pieces to mirror holder diagonals. (above) is an effective way to prevent the lower mirror from directing ones vision onside the tube, though it not necessary. 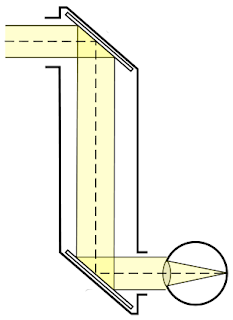 Periscopes were invented to look above or around obstructions, or to look at something from a concealed position, as in the classic case of the submarine periscope. While we encourage the use of periscopes for these purposes, it should be noted that periscopes are a useful way to explore mirrors and reflection. 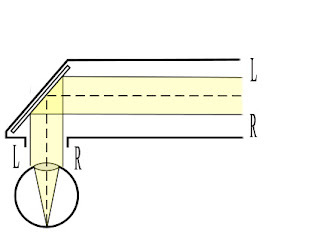 In a periscope the mirrors are angled at 45 degrees. The upper mirror collects light form outside the tube and sends it down the tube, the lower mirror catches the light and sends it out to your eye. Apart from being able to change the direction of a beam of light, mirrors have the interesting quality of inverting what they reflect. The mirrors invert the image individually. If you were to remove one the mirrors and lay the periscope down on its side everything on the left would appear on the right. This occurs because the light coming into the tube on the left encounters the mirror first and ends up on the viewers right, the light coming in on the right hits the mirror later and ends up on the left. Most periscopes have parallel 2 mirrors, which counters image inversion as the second mirror re-inverts the light from the first, creating a normal image. However, making the mirrors non-parallel by rotating the top mirror independently of the bottom has interesting and illustrative effects. If you rotate the top mirror 180 degrees from the parallel position so the periscope up to looks behind you, the image will appear upside down. Perhaps more interestingly if you turn the top mirror 90 degrees to the right the image will appear sideways with the right side on the bottom. If you turn the top mirror 90 degrees to the left the image will appear sideways with the left side at the bottom. It is for this reason that in a submarine periscope the whole tube is rotated to look around not just the top or bottom.